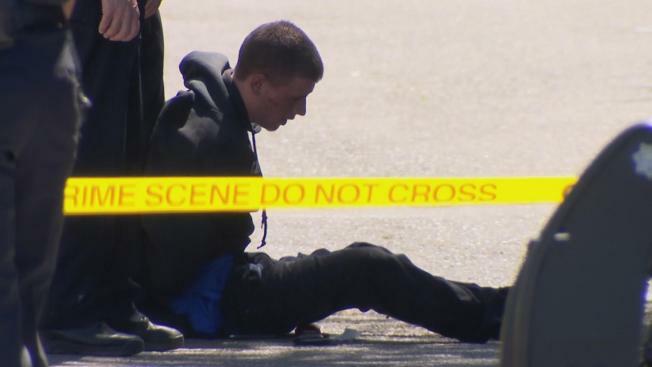 A high school and an elementary school were placed on lockdown after police found a gun while chasing a suspect in Cupertino Monday. Homestead High School in Cupertino was temporarily placed on lockdown Monday afternoon while police searched nearby for a suspect wanted in an alleged domestic violence attack. The campus lockdown was lifted just after 2 p.m. and one suspect was taken into custody, officials said. The police activity took place in the area of Homestead and Noranda. Police said they first responded to a report of a domestic violence incident behind a 7-11 store near the school. When officers arrived, a male suspect fled and started jumping fences. Police recovered a gun at the scene of the initial incident, triggering Homestead High and a nearby elementary school to be placed on lockdown. The suspect ultimately was confronted and fought with officer before he taken into custody, police said. The suspect suffered injuries from the scuffle and received medical treatment. Homestead is a four-year public high school on the border of Cupertino and Sunnyvale. Students who attend the school said it was placed on a code red lockdown Monday afternoon. "School under code red lockdown no idea what's going on alarm going off," tweeted student @graypemountain. "Ambulance sirens in distance, no idea if related." She tweeted at 2:09 p.m. that "All clear from police has been given."